Tropical Storm Isaac may grow into a hurricane on a path toward the west coast of Florida, where the Republican Party holds its national convention next week. The National Hurricane Center’s tracking map shows the system crossing Haiti on Friday and striking Cuba before arriving at the Florida coast below Cape Coral on Monday. That’s the opening day of the Tampa gathering at which Republicans are expected to nominate Mitt Romney as their presidential candidate. The center said Isaac may become a hurricane Thursday, return to tropical-storm level over Haiti and Cuba and then regain hurricane strength en route to Florida. 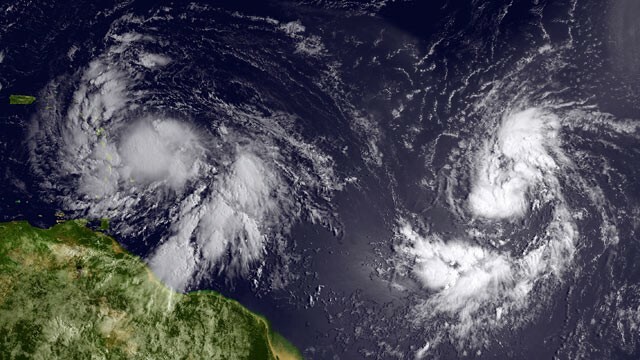 The US National Hurricane Center on Wednesday morning said Isaac was expected to strengthen and could become a hurricane by Thursday. Convention organisers knew it was a possibility during the peak of hurricane season. About 70.000 delegates, party officials, journalists, protesters and others are expected to attend. It’s been 90 years since a major hurricane made a direct hit on Tampa, the site of the convention. Florida (historically the nation’s top target for tropical systems) has not been hit by a major hurricane since Wilma in 2005. National Hurricane Center computer models had predicted Isaac would become a hurricane over the next few days, meaning maximum winds must be at least 74 mph. Some models had the storm striking Florida, including the Tampa Bay area, after moving across Cuba or the Bahamas as early as Sunday morning. Jeff Masters, director of meteorology at Weatherunderground.com, said long-range storm track predictions five days in advance are notoriously inaccurate, often off an average of 260 miles. But Masters said the climate situation has improved chances that Florida could be in the system’s sights during the Republican event that runs Monday through Thursday. Republican National Convention communications director James Davis told the Christian Science Monitor that party officials were monitoring the situation. “We’re in close touch with all the federal, state and local agencies. We’re focused on preparing still and having a great event starting on Monday” – Davis said. Republicans did game-plan for a hurricane, running a mock-hurricane drill in May. Those plans may need to be put into effect. Dr. Jeff Masters, a meteorologist for Weather Underground, estimates that there is a 3 percent chance that Tampa will need to be evacuated during the Republican National Convention. Republicans canceled a day of the 2008 Republican National Convention in St. Paul, Minnesota, despite the fact that Hurricane Gustav was making landfall over 1.000 miles away on the Gulf Coast. While Gustav obviously did not affect Minnesota, the GOP feared that the juxtaposition of a convention with a hurricane in the Gulf would conjure memories of Hurricane Katrina, and the Bush administration’s disastrous response to it. As of Wednesday morning, Tropical Storm Isaac was located 210 nautical miles east of Guadaloupe, with sustained winds of 45 miles per hour. It is projected to pass near Hispaniola and Cuba, before turning north toward the Florida Keys. The storm is forecast to reach hurricane strength by Thursday afternoon. This entry was posted on Thursday, August 23rd, 2012 at 4:42 am	and is filed under Catastrophes. You can follow any responses to this entry through the RSS 2.0 feed. You can skip to the end and leave a response. Pinging is currently not allowed.